I am not a drinker. I've been known to have a glass of wine on a rare occasion, but I am a huge fan of frozen concoctions without the alcohol. 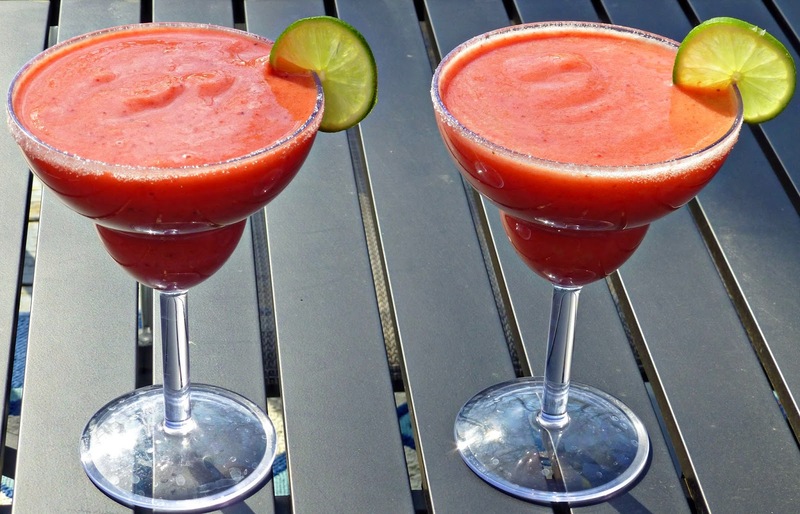 Normally I am a smoothie girl, but in the spirit of Cinco de Mayo, I want to share with you my all time favorite Virgin Strawberry Margarita Recipe. Cinco de Mayo is all about family and food, so this is the perfect recipe that everyone will enjoy! Place ingredients in blender and pulse until crushed and slushy. Pour into serving glasses and garnish with whole strawberries and lime wedges. If it is too thick, add a little more thawed limeade and orange juice until you get your desired consistency. I prefer the non alcoholic kind, too, but mostly because I don't like to drink my calories ;) That sounds delicious! It might be delicious but it looks like my last Sunday's hungover feces output. It sure looks pretty. I remember ordering virgin drinks for my oldest, for some reason that was all the craze for kids way back then. I don't think I've ever tried a margarita, w/or w/out alcohol. Guess I should buck up and give it a whirl. I bet the kids would love if I busted this drink out at the next family bbq. Mmm! looks so delicious! Will definitely try this! That sounds yummy! I love strawberries. I've been on a smoothie kick. Usually I load it up with greens just because of how I'm watching what I eat. I'm like you. Not a fan of the alcohol taste....even though I love making wine. lol This looks so good that I had to pin it Theresa! Cheers. These look really delicious to enjoy on a hot day! Anything strawberry is fantastic in my book! These look yummy! Yum. Thanks for sharing! I'm going to try making these! These look really good! Since they are nonalcoholic the whole family could celebrate Cinco de Mayo with me! Haha. I only like this kind of thing when there's alcohol in them, otherwise I won't drink so many calories. But throw a shot of tequila in there and I'll be all over them! This is my kind of margarita!! I bet my entire family would love to sip one of these on a hot day!! I must try this recipe! As a person who doesn't drink alcohol; you just spoke my language! I absolutely love virgin margaritas! And this one is so divine! I'm not a big drinker and often will just enjoy a drink socially if that. However, I do like frozen drinks like this one so I like the idea of being able to enjoy them without alcohol. Awesome summer drink; kind of like a smoothie. I personally don't drink alcohol so this is good. Thank you for sharing this recipe I do not drink alcohol so this non alcoholic strawberry margareta is perfect for me. That looks like a yummy summer time drink. Especially when I am not in the mood for alcohol. Yummy! This is delicious and delightful I will have to try it. Now that is awesome - I would love to have a try on this! These look simple delicious. I love a margarita but even better if they are alcohol free. I really like this recipe esp to have for friends that cant or don't want alcohol in their drink. Sounds yummy! I do like them with alcohol, but honestly, I'd be happy either way. These sound fabulous! Hmm...Maragaritas! I like them with alcohol too but love having an alternative! Yay for margaritas, alcoholic or virgin! That looks absolutely yummy! These would be great for summer. I am sure I would love them. Mmmm! I would love to have one of those right now. What a great drink for summer. While I am a big fan of the alcoholic version, these look so refreshing. I'd definitely drink this to cool off on a hot day! I could definitely go for a margarita right now. They're my favorite! I'll keep this recipe around for those times when I shouldn't have the alcohol! These look really delicious and I am so going to give this a try. I don't like too much alcohol so this would be great to try. I'm allergic to alcohol, so this is perfect! It looks yummy!